Below is some FAQ's Regarding Election DAy. At what Time are the Polls Open? Do I have to be Registered to Vote on Election Day? Answer: Yes. Voter Registration closed at the beginning of October. If you weren't registered by then, unfortunately, you can't vote in the 2015 Municipal or Special Election. Answer: It depends on which precinct you live in. 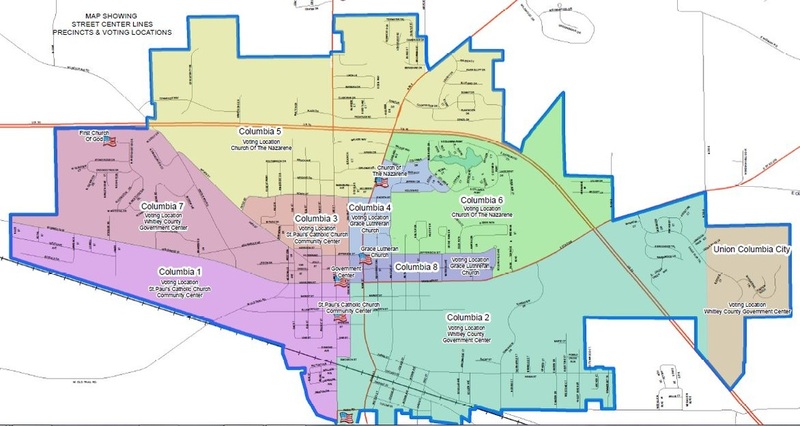 Below is a Map of the Precincts and the Voting Locations of each Precinct. For Example, Deer Chase and Eagle Glen vote at the County Government Center, while most of Columbia Shores and Cambridge Crossing votes at the Church of the Nazarene. Answer: Yes. State Law Requires valid, government-issued photo identification in order to vote. If you don't have a driver's license, you can get an ID card from the Bureau of Motor Vehicles on Denzil Drive. What will I go through in order to vote? Answer: When you first arrive, the Poll Inspector will check your Photo ID and the Poll Clerk will have you sign your name attesting it truly is you that is voting. The Clerk will then give you a Voter Ballot Card. You will then give the Card to the Poll Judge who will assist you in turning on your voting machine. If you have any voting questions (not candidate/issue specific), you will need to ask the Poll Judge at that time. The Poll Judge will then leave you and you will vote in privacy. After you have voted and confirmed your votes, you are free to leave to voting location. It normally takes 5-10 minutes total to vote. Answer: The County Clerk of the Courts (Debbie Beers) is officially over the Election Process. She is assisted by Jessica Hockemeyer in the Elections Division of the Clerk's Office. Both Debbie and Jessica can be contacted at (260) 248-3164. What if I need a Ride to the Polls?